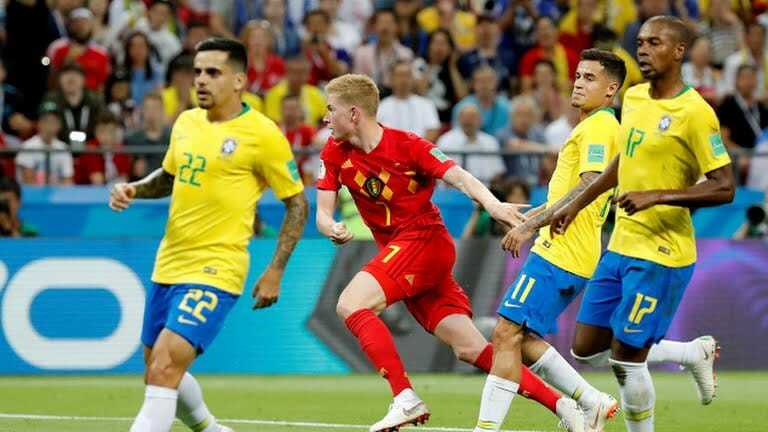 Belgium stunned favorites Brazil 2-1 to sail through to the semi-finals of the World Cup in a nail biting encounter played at Kazan Arena, Kazan, Russia on Friday. An own goal from Fernandinho in the 13th minute, 11th of the tournament, and Kevin De Bruyne’s rasping shot in the 31st minute from a devastating counter-attack were enough to humble the five times world champions. Renato Augusto netted the consolation for Brazil with a well taken header deep into the match but, the game was already locked for Belgium. The victory was the Red Devils’ fifth consecutive at the World Cup, a new national record. Brazil’s exit leaves no South American team at the Russia showpiece after Uruguay, another hopeful from the CONMEBAL region, also lost to a European opposition, France, in the other fixture of day. Going into crunch tie, the Selecao had only conceded once and had gone 310 minutes without letting in a goal, but that strong defense marshaled by Thiago Silva could not withstand pressure in Kazan. Fernandinho turned the ball into his own net, whipping it in using his shoulder off a corner kick. Previously, the Tite’s men looked the better side and could have taken the lead a couple of times but, they were unlucky in front of goal. Feeling rattled after conceding the goal, they surged forward in search of the leveler leaving their rear guard exposed to Belgium lethal counterattacks. And Kevin duly punished them with a swift counterattack after being set up by Romelu Lukaku in the 31st minute. The second half was all about Brazil as they dominated possession and created numerous chances in front of goal, however, a disciplined Belgium defense manned by Vincent Kompany never lost shape. Renato finally got a break through with less than 15 minutes go with a fine header to reduce the deficit but the Selecao could not complete the turnaround. The win was a sweet revenge for Belgium, who Brazil knocked out of the 2002 World Cup through Rivaldo and Ronaldo goals at the same stage. The Red Devils will face France, who beat Uruguay 2-0 in the round of four.